Click on the image to open up in Youtube. Worried About Memory Loss? Pick up your Dancing Shoes! Dancing can reverse the signs of aging in the brain. Physical exercise has an anti-aging effect on the hippocampus region of the brain — an area that controls memory, learning and balance. 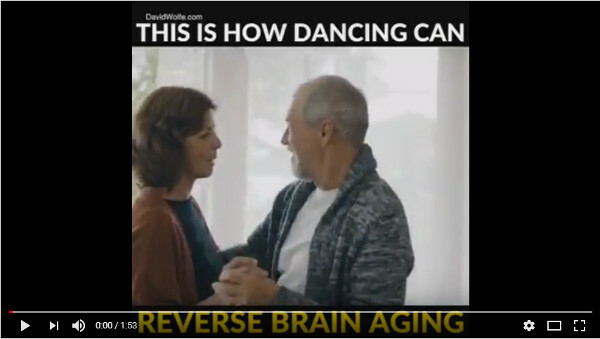 A recent study published in Frontiers in Human Neuroscience has found dance classes can prevent and reverse some signs of aging in the brain! The 18- month study looked at seniors with an average age of 68 and placed them in either a group challenged with dance routines or a group challenged with repetitive endurance exercise such as cycling. The dance routines contained many challenges and changes every session including changes in steps, arm patterns, speeds, choreograph and genres. 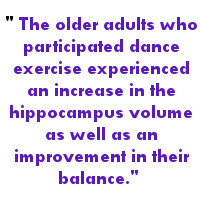 The older adults who participated dance exercise experienced an increase in the hippocampus volume as well as an improvement in their balance. This is very significant because the hippocampus is the earliest and most severely affected brain structure in individuals with dementia. It is a brain area that is responsible for not only memory and learning but also for keeping one’s balance. This study has since generated a lot of popular articles and videos over the past 12 months, but there is one particular video available on YouTube is that is of special interest, since, along with dancers from all over the world, it includes a short clip of some VBDS Members of long-standing. The brief footage of VBDS Members in the YouTube video was taken a number of years ago, in the downstairs Dance Studio at Saanich Commonwealth Place, as part of a pilot for a TV series. We hope you can share this with your family and friends and spread the good word! It’s never too late to pick up those dancing shoes! https://vbds.org/wp-content/uploads/2016/07/logo.png 0 0 Chrissy Southern https://vbds.org/wp-content/uploads/2016/07/logo.png Chrissy Southern2018-07-03 13:40:462019-03-07 08:59:16Dancing can reverse the signs of aging in the brain! Volunteers! You’re Our Fuel! IMPORTANT NOTE!